This article is part of our Team Dynamics series. Admit it. You don’t always run ineffective meetings. But when you do, you make sure they last an eternity, have pointless agendas, and cause participants to run and hide each time you call one! But you’re also aware that meetings are important. They are an essential time for team members to communicate and collaborate. However, you just seem to go through far more bad meetings than good ones. Instead of being efficient and productive, your meetings are often quite the opposite. The idea that meetings are wasting time isn’t news. 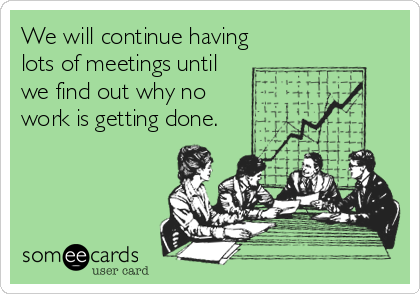 Given that time is money, just how much of it do you spend on ineffective meetings? Let’s say you’re a small company with 5 team members. The average salary is $100,000 a year, and the team spends 15% of their time in meetings – that leaves you with $150,000 yearly expense! You better use that money to pay for an army of consultants to teach you how to run effective meetings. Or, just keep on reading and learn how to do it yourself. So, even though most of your meetings are bad and cost a fortune, the chances of ditching most or all of them are pretty slim. Your team still needs to collaborate. The good news is there are better ways to hold a meeting. When done well, a structured meeting can be a valuable tool for pushing your team’s progress forward. So, let’s see how you do that. Think of the last time you were on a bad meeting. Before you were tempted to escape through the nearest window, what did it look like? You probably came not having a clue about the purpose of the meeting. People arrived late, the agenda wasn’t clear, or you didn’t even had one. Soon the meeting was derailed when someone randomly went off topic. While others spent their time doodling, or checking their phones and laptops. The whole meeting droned on forever and you would have rather been productive somewhere else. As the meeting finally came to the end, no debrief or action steps were defined and you simply left wondering why you were even present there. It’s not hard to tell. These are all typical and long-standing issues associated with bad meetings. Now, how should a good meeting look? It’s all about the mindset – all team members who participate in the meeting should share a belief that meetings are real work. An effective meeting should leave you energized and feeling that you’ve really accomplished something. Start with the objective and finish achieving the same one. Take up the least amount of time as possible. Leave participants with clear actions steps. Still, successful meetings don’t just happen. There are several things to learn about running meetings before being able to effectively execute them. To get you started, embrace the idea that the meeting process is what determines the outcome. 2. Those which you have to decide to have. How do you know if a meeting is necessary? Ask yourself – “If I was sick or stuck in traffic or overcrowded with work on the day of the meeting; would it need to be rescheduled?” If the answer is “no”, then your meeting doesn’t really need to happen. Simply put, the meeting is called when input, interaction, and feedback is required for some kind of decision to be made, and it is required for more people to be there. 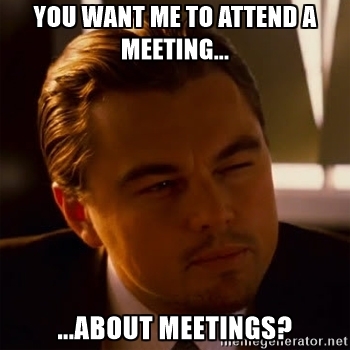 Now that you know if you need a meeting, there is still a chance for you to screw up when it comes to running one. So, let’s see how not to let that happen. As with everything else in life you start by asking “why?”. There needs to be a very clear need behind anything you commit your and your team’s time and energy to. So before you decide to call for a meeting, be clear on its purpose. What is the outcome you desire to achieve with this meeting? This means your meeting should have a clearly stated objective. Ideally, there should be a question to be answered or a problem to be solved. Since you are used to having meetings every once in awhile, have in mind that the only thing worse than attending a meeting with no stated purpose is attending a meeting that has dozens of different ones. This won’t get you anywhere but to endless discussions with little to no chance of getting to the actionable point. So, for a meeting to meet its outcome, make sure you are clear about what that particular outcome is. Why do you need to hold this meeting now? What’s at stake if you do not hold this meeting? What are you expecting from people at the end of this meeting? Do you want a decision? Do you want to generate ideas? Are you synchronizing work with others? What do you need to achieve during the meeting to call it a success? This is where you lay out everything you plan to cover in the meeting, along with a timeline that allots a certain number of minutes to each item, and the name of the person responsible for addressing the particular issue. And there you have an agenda – the list of items that clearly flows out of your stated meeting purpose. If you need an agenda example, check out this article: Weekly Review and Planning Meeting. Now, what you might have neglected is that the worst thing you can let happen to your meeting, is to spend time talking about ideas or initiatives you most probably won’t take action on. The same goes with clogging the agenda with unrelated items, or issues that can be addressed outside a meeting. For these a simple email will do. As much as you try to structure the agenda, people somehow end up getting lost. This is where team members start to bring up related, but irrelevant side issues instead of working towards your solution. When this happens, make sure you have a place to put all those side issues. Good practice is to have a so-called “parking lot” or a “hanger”. That might be a flipchart or an open document. Whatever you call it, it should serve to keep track of those off-topic, but still relevant issues for later. But be careful! Don’t treat this practice as a black hole. Make sure you really get back to those issues when needed: track them and have a person responsible for them. The more people you add to the meeting, the more it’ll cost you. The key is to bring as few people as possible to the meeting, and get the most out of every participant. Take the time to think about who really needs to be there. Those are the people who actually have the impact on making a decision. And when you do get the “right” people in the room, make sure they are properly prepared. Good practice is to use quick huddles, office fly-bys, one-on-one conversations with team members in order to gain inputs and consensus before and outside the meeting. Having these in advance leaves more time for actual progress during the meeting. Once in the meeting, nobody wants to talk about problems, bring solutions! Participants should be focused on making a decision they can act on immediately, or as soon as they leave the meeting room. When in a meeting, you’re trying to deliver a purpose. So it can help if someone takes responsibility for staying focused and on time. It takes one person to do that. Usually, the one who initiated the meeting takes the “role” of facilitator. Once you have the right people in the meeting, as a facilitator you can start “playing the orchestra”. This means you should help everyone participate fully, ask the right questions and make sure the best energy and ideas are coming to the surface. Facilitators guide the conversation by pushing the agenda forward, steering the discussions back to the initial purpose of the meeting, and helping the group with decision making. Still, no one ever learned anything while speaking. So to be a good facilitator, be a good listener. However, maintain a balance by knowing when to step in, and when to say “no” in order to stay focused on what’s important. Think of the time as an asset. You do what you can with the amount you’re given. You realize it’s precious and you don’t want it wasted. 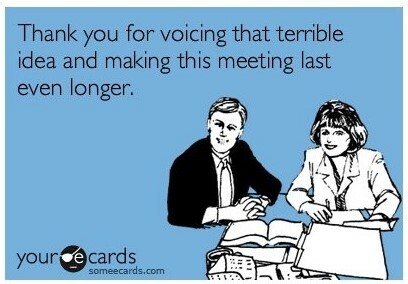 Still, a lot of time is wasted on long meetings. Having thirty of your employees on a one-hour meeting results in a loss of 30 hours of work – actual work. This hinders your company’s productivity big time. And the same goes with human brain when you trying to force it to process all that information it takes in during a long meeting. Consider that when people are given a certain timeframe, they tend to fill it. The problem is that when you give people one hour or even half hour meetings, they will have no qualm to use up a lot of that time to show up late, grab a coffee and chat about last night’s party. While the rest of the time will go to the actual topic of the meeting. But what if you cut the time in half? When constrained with time limitations, people feel the urge and experience creative bursts. So with half the time, you could still get the same amount of work done, but with fewer chats and aside jokes. Learning to cut meetings down to exactly the time needed can help your team accomplish twice as much in half the time. Another good practice is to keep meetings short, but with higher frequency. When you are a team leader or working with a the team, 5 minute one-on-ones with each team member every day, can bring much more value and efficiency to everyone’s work. So far you may not fail in setting the agenda and in keeping your meetings short. But the real challenge you may find is when you fail to have everyone actively participating during the meeting. 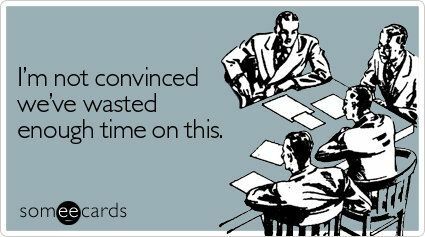 It’s when you try to keep the meeting productive but are faced with silence and head nodding. These reactions can mean different things, but it doesn’t necessarily mean that silence is consent. It’s more likely that people rather decide not to speak up as they feel their opinion doesn’t count or they don’t want to create conflict with disagreement. This can add a lot more time to the meeting. Even worse– when you do seek agreement from the group, it gets noisy. It’s likely that you will have to face stubbornness from those who simply can’t let go without the capitulation of the other side. Failing to cut these down might leave you watching as your meeting goes “down the river”. To be able to handle these situations as the facilitator, make sure you take the right approach. It is important to ensure different opinions are heard, while also stepping in the way of useless discussions. To make it possible for multiple perspectives to come out in an interesting way, you can use a concept called: The de Bono Group’s Six Thinking Hats. Keep the discussion focused, while making sure everyone is participating in the meeting, try asking meaningful questions: Why are we here? Is this helping the bottom line? What evidence is there to support it? Why do you think so? What other options are there? What don’t we know? Still, the most important question to ask in a meeting is yet to be discussed. #7 What Are The Action Steps? If you got to the end of the meeting without having clear next steps, you may as well have not had it to begin with. Or it may be that you did agree upon some actions, yet they never saw the light of a day. It’s likely that no one was assigned with the responsibility and the deadline to complete those actions after the meeting. So either don’t have the meeting if you don’t believe it will generate a tangible outcome, or make sure you have the action steps as your main output of the meeting. Be clear about who is going to do what and when. Otherwise it’s not going to get done. While doing the wrap-up confirm whether or not your meeting has fulfilled your objectives. If it turns out your meeting has left you with additional questions or new topics, suggest further action or reschedule follow-up meetings as needed. 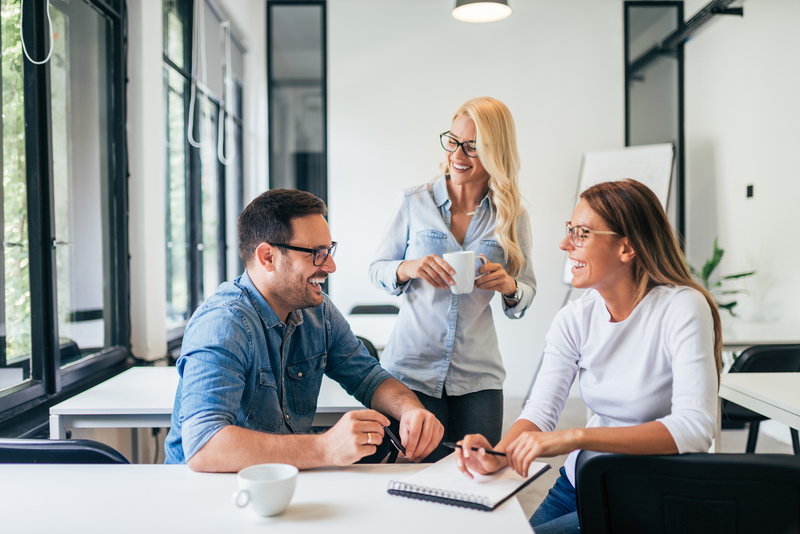 Once you have all the essentials in place for your next meeting, consider using a project management tool that will make success twice as easy. Having your meetings flow, visualized, and tracked in one place can give you an edge. There are a variety of tools out there you can put in use, but since we are from Yanado we will show you how true Yanadoers do it. We thought through all of these guidelines from above and decided to put them in practice. So we created a Use Case on how our users harness the power of Yanado to power up their meetings. Check out How To Use Yanado For Running Effective Meetings and let us know what you think! So, let’s “debrief it” here. Ask yourself: If meetings were an investment, how great is the return you need to see? As with anything else you do, try to trace what works and what doesn’t and always leave room for improvement – practice makes perfect. We gave you some pieces of advice and a tool you can put in use for practically any type of meeting you have. Give these a try and let us know if your meetings got any better.